Ever Thought Having Type 1 Meant You Were Limited? Some of these studies lead me to so many more questions than there are answers. For example: who thought of the initial study in the first place? What made the originator wonder about it? Do they have diabetes themselves? Who do they know, and what is that person doing, that made the question come to mind at all? Alas, these questions remain unanswered for me on today’s study. The title of this one is Aerobic Exercise Capacity and Pulmonary Function in Athletes With and Without Type 1 Diabetes so you can see why it caught my eye. Of course, if I wanted to read more than the abstract I’d have to pay for it and I’m not one to do that… although maybe I’ll head to the health library and check it out someday because I’m curious. The only real difference it seems they found between those with type one diabetes and those without was that the type one participants had a lower anaerobic threshold. This anaerobic threshold is the point at which the body uses a different energy source (lactic acid rather than oxygen) to fuel muscles and interval training is the way to raise this threshold. One of several reasons I am always in support of interval training! In all, the conclusion is what I consider a happy one: aerobic capacity in subjects with type 1 diabetes with programmed exercise is similar to the capacity of normal athletes despite lower anaerobic threshold. Yet more proof that type one diabetes has no business getting in the way of your being a fit and healthy exerciser. Okay. So. I’ve been whining about you getting outside for months now and I bet you don’t even hear me anymore. I still want you to have awesome workouts, even if (especially if!) you are in the same gray gym on a gray snowy day in the middle of winter. The following routines are GUIDELINES not rules… do what works for you!! You’ve got 30 minutes to spend on the treadmill? You’ve got 25 minutes to spend on the bike? And a 5-10 minute warm down on the bike. You’ve got 40 minutes to spend on the elliptical? Let me know what you tried, how you did, and how your blood sugars ran with these interval workouts. Way to rock your winter workout! Prevention magazine has published a list of the best walking cities for several years in conjunction with the American Podiatric Medical Association. Because tonight is the D.O. it! Holiday Lights Walk I thought I’d go through the list for the cities regularly ranking highest on the list. The criteria for the list are generally that the metropolitan area has safe streets, beautiful places to walk, mild weather and good air quality. They also factor in the number of athletic shoes sold in the city, the percentage of adult population who walk for exercise, the use of mass transit, and the amount of parks per square mile. Has your city ever made the list? Do you think it should have made it? I see that Buffalo, NY is always toward the bottom… not ever having been to Buffalo, NY I figure that’s because the weather puts it down at the bottom. What about other places you’ve been? One thing I love the best when I take a vacation is walking through the city I’m in. I like to see what life is like in a new place. I’m excited to know that I have walked in each of the cities on the 2010 list! It’s interesting to see how the lists have changed in recent years. But it’s also useful to know these cities are good places to walk… it might save you some money on a rental car for your next vacation! I hope you enjoy a walk tonight… and see some lights!! Whatever You Call It (Sugar/Carbohydrates/Glucose/ATP/Energy) We Need It! For someone with either type one or type two diabetes, how messed up is our digestion process? At the basic levels, we share a missing proper function. When we eat food, the body extracts carbohydrates from the food we ingest and break the carbohydrates down into glucose. From the walls of our small intestines, the glucose goes one of three places. Into our bloodstream. In our bloodstream, the glucose is immediately available to be converted into adenosine triphosphate (ATP). ATP is what the body really uses as its actual source of energy. Into our liver. The liver stores glucose as glycogen. When functioning properly, the pancreas produces one of two hormones that work in tandem with the liver to regulate blood sugar levels. When the pancreas senses blood sugar is too low, it produces glucagen to stimulate the release of stored glycogen from the liver in the form of glucose into the bloodstream. When a normal pancreas senses blood sugar is too high, it produces insulin to stimulate the liver to release less glucose. Clearly, it is that third process that doesn’t work so well for those of us living with diabetes. You can see our bodies are a maze of thousands of signals and communications and sensors and responses… it’s amazing that we even know this much! Not to mention how losing a critical hormone production in our bodies and still being able to survive is simply amazing. Is It Really Such A Small Thing After All? Geez. It makes me so happy when other people know what it is! I felt like a cornball for the grin I showed him. Then again, HE reached out to ME so maybe he feels the same way I do. He has type one diabetes just like me. He showed me his tattoo of an insulin syringe on his forearm. He said he’d tried a pump but didn’t like feeling attached. I told him I eat too often to always give myself a shot. He said he takes about 8 shots a day to accomplish the same thing. That was about it, but he’s my current favorite employee at that grocery store. It is such a small thing– meeting another type one and sharing less than 30 seconds together. But it doesn’t feel small; I assure you. I feel in a way I’m preaching to the choir now but it seems that I feel I can only truly relate to someone else who lives with type one just like me. Someone who has been 400+ after being 35 an hour before. Someone who knows how many ways a low can feel and how frustrating every high can feel. How the volume of our internal monologues may increase or decrease, but will never be silent. How we’ve learned through the years to do our best to take it all in stride and keep moving through life. I don’t mean to minimize the importance of support from friends and family: that is huge. But this one is a different and very touching feeling for me. This one is one that doesn’t require anyone to say “I know how you feel”. I know it just meeting him. It’s a kind of quieting inside and rather difficult to explain. But I felt in those 30 seconds I had made a friend. A friend who could be closer to me than most, in fact, despite the many different experiences leading to our meeting at the grocery store. It’s a very cool thing to meet another type one. AND, you know what else is super cool?? Watching a fellow type one race around the world and WIN. Congratulations to Nat and Kat!! The Mayo Clinic diabetes educators have a blog I read when they post every week or two. I think they are well-intentioned despite the fact I still sense a condescension vibe from it sometimes. I don’t know why! Their blog yesterday highlighted how important it is to recognize that taking a “break” from your diabetes care can be important. For me, taking a break from my diabetes care primarily means taking a break from making myself feel badly about not doing enough. Diabetes is with me for the long haul, and I can’t do it right every day or every week or even every year. It’s going to have its ups and downs, just like the rest of my life. I just don’t have quite as clear a target range with the rest of my life as I do with my diabetes. As an example, I was talking to my bootcampers this morning about the clothes we wear. I mentioned that the more I transition away from practicing law and into physical fitness, the more elastic waist pants I wear, and that makes me somewhat nervous. I need to watch my weight because a clue of weight gain for me in the past was how my pants fit! But whether or not I am comfortable in my jeans depends on my weight and when I washed the jeans. Whether I hit my BG target is right there on that little screen every time I check. It doesn’t take days or weeks to notice: notification I am not in range is right there in front of me several times every day. And that is indeed hard to live with. 2010 has been a rough year in my personal life this year, and I know my care has suffered along with that. But I can’t feel badly about that: I need to recognize that in the course of my life there will be different patches and my diabetes will have its own corresponding ups and downs too. Diabetes is always going to be a process more than a project; you know that if you’ve ever done the same thing at the same time and gotten different results. It’s the nature of the disease and the nature of our lives. Take breaks, forgive yourself, but don’t ever stop. You’re worth much more than that! I think I’ve mentioned this before, but I use running as a form of meditation. But not everyone loves every run. So what happens when you HATE it but you’re out there anyway? Runner’s World has some ideas. I think they apply in any situation, not just when you’re running. Shoot, I’ve used them while I wash the dishes or clean up my house. Think Small. Run to the end of the block, or to the next tree, or just one more mile. Whatever you choose, forget the big picture and set small goals. Once you’ve reached that one, set another one. Repeat a Mantra. I have a couple of them, and I’m not kidding “I hate this” has worked for me on a few occasions. “Keep going” is a good one that I have used so much I put it on my Road I.D. I ran a half marathon behind a woman who had penned on her shirt “Just keep swimming.” No matter what, repeating something to yourself will help get you through. Visualize Success. When running, you can think about something or someone painful in your life that you’ve conquered; visualizing yourself passing through that period can help you get some perspective on this measly little jaunt. Shift your Focus. If you have a goal in mind, focus on the goal and the discomfort of running (when it is discomfort and not something more important like acute pain) will fall away. I have used this when in the higher miles of a marathon: what do I want? To finish. Thinking of myself already past the finish line and knowing I have to earn that helped me keep going. I can’t say any one of these made me a runner. I can say that drawing on each of them at different times and knowing that they are there for me whenever I need them has made me a more relaxed person and more confident in myself and my abilities. Seems like a pretty good tradeoff. Professor Brian Wansink is a smart guy. He has written a number of books and more than 100 academic articles on eating and why we eat more than we think we eat. Fascinating. He’s one of the smarties behind the 100 calorie snack packs. I told you he’s a smart guy! I know for me that I realized when I was trying to lose weight that it was better for me to accept that I could not (and still can’t) stop eating halfway through a bag than it was to try and change that about myself and my eating habits. But what I could change, and did change, was the size of the bag. I’m sure we’ve all hit blood sugar numbers way higher than we expected because we weren’t paying attention to how much we were eating. I’ve been known to frequently double-bolus (prior to eating for what I think I’m going to eat, and then after eating when I try to compensate with extra insulin for the additional food I did eat). So how do we change our eating habits if we don’t even know what those habits are?? Sit next to the person you think will be the slowest eater when you go to a restaurant. In a group, be the last one to start eating when a plate is put in front of you. At home, put high-calorie foods on the plate before you sit down at the table. Conversely, bring the veggies with you to the table. At a buffet, put only two items on your plate at a time. Never eat directly from a package. Wrap tempting food in foil so that you don’t see it. I’ve got a few additions to this brief list. For me, it works to keep the more dangerous foods out of the kitchen and put them in another space altogether, like in our garage. If I don’t want to eat it, I don’t buy it. I drink a lot of water. If I want to slow down my eating at any certain meal, I’ll make myself drink twice the water than I otherwise would. None of these strategies are going to melt off any weight on their own… but they won’t sabotage your efforts, either, and they are pretty subtle changes that make it easier for you to take off the pounds one at a time. It’s worth considering. Have you come up with strategies that have helped you? Please share them! Did you know the BMI measurement was “invented” in the mid 1800s? A Belgian statistician and social scientist named Quetelet (currently topping my list of favorite names) came up with the formula: an individual’s body weight divided by the square of his or her height. 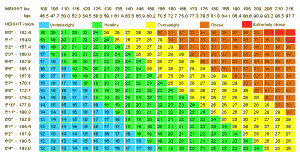 Although it doesn’t measure body composition (percentage body fat), it can still be useful. Looking at what I used to weigh, I had a BMI of 32. I was obese. It is funny to think about it now, but also pretty frightening. I am now at roughly 23-24. Not bad. In a recent study, researchers compiled data from more than 1.4 million people and came up with some interesting results for the best Body Mass Index in otherwise healthy adults. Get this: the subjects (healthy adults) with the best survival rate after ten years were the nonsmokers with a BMI of 20-24.9. At the same time, obese nonsmoking women with a BMI of 30-34.9 were 44% more likely to die than the 20-24.9 group. Forty-four percent higher risk of dying within ten years. Yikes. 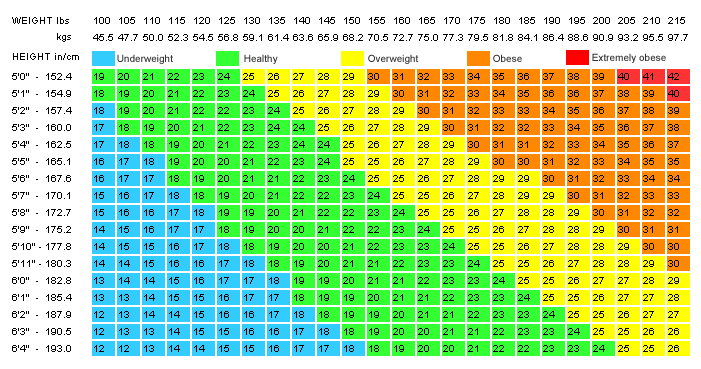 The difference between a BMI of 24.9 and a BMI of 30.0 is about 30 pounds. Thirty. If you have more than 30 pounds to lose, start working on losing it now to treat yourself and your body appropriately—the longer you wait the less time you have to do it. Faring even worse was the group of extremely obese nonsmoking women with a BMI of 35-39.9: they were 88% more likely to die within 10 years than the 20-24.9 group. The study also found a correlated increased risk if the subjects reached a BMI greater than 25 by the time they reached 50 years of age. And these are all non-smokers! I blog about this subject today because knowledge is power and I am always aiming to empower you. It’s exciting to see a changing BMI because it only enforces the fact you can absolutely change your body. YOU HAVE THAT POWER. If you need some help please don’t hesitate to contact me; we’ll talk about a strategy and keep you on a path to success! And you know what? I just don’t like reading it. I never have. I do my best. I really do try to read the whole thing through without getting upset. But it just doesn’t make me feel good to read it. Ever. I’m not sure how much has to do with the fact I feel that a large part of the magazine directed to type 2 diabetes doesn’t apply to me or my disease, but I don’t really think that is the true issue that might explain my discomfort with reading the magazine. I just don’t like looking at all the Don’ts and the Eventuallys and the Watch Outs. I don’t like being told I’m a potential victim. In fact, I hate it. I hate it so much I’ve pretty much designed much of my life to combat the thought in advance. I don’t like reading about how to eat fewer carbohydrates. I don’t like reading that eggs might be bad for people with diabetes. I don’t like seeing ads for socks and comfortable shoes. I simply don’t like it. Maybe I’m denying this truth of diabetes. It feels more like I’m questioning how true these complications really are. For ME. – Know when to ask for help before things get out of control. Talk to your doctor or diabetes educator or to a trusted friend or family member. – In 2008, 1 in 5 U.S. hospitalizations involved patients with diabetes. – More than 60% of lower-limb amputations that aren’t caused by injury occur in people with diabetes. See, living with diabetes isn’t just about doing my best to keep my blood sugars in check and eating well and exercising to keep my body working as well as possible all the time every day no matter what else is going on in the world or my personal life or career. It’s also about seeing articles about heart attacks and morbid obesity and losing feet or toes and answering questions and explaining and hearing and seeing advertisements for blood sugar meters that seniors can’t understand and are complaining about the pain of checking their blood sugars twice a week. I don’t need the fear motivation. I don’t need to discuss the pain of finger pricks. I have lived with my disease for nearly 23 years. Each and every day. I’m not one who needs convincing to take care of myself. I could use some humor; I could use some motivation and encouragement. I think we all could. How about it, Diabetes Forecast? I’ll look for some of that in the next issues but I’m sad to say, I won’t hold my breath.